50 km from Palma, the capital, and southeast Mallorca, we find the beautiful town of Felanitx. A quiet town which, due to its coasts bathed by the warm waters of the Mediterranean and its wonderful natural environment, has been positioning itself as one of the most visited destinations of the Balearic Islands. This beautiful Balearic corner is divided into three areas: Sa Marina, the southern sector of the Sierras de Levante and the area of ​​Pla. Felanitx enchants the visitors with its amazing sunrise, its vineyards and its landscape architecture. Another characteristic that makes this place unique is its production of ceramics and pottery, which is well known since the 3rd century, as well as its wine. 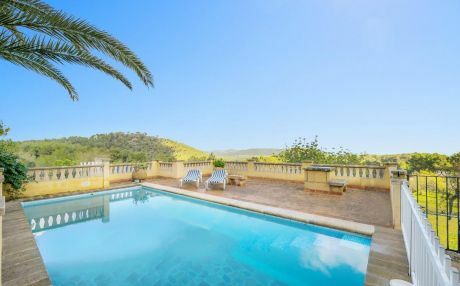 This charming villa has maintained its historic legacy with an innovative spirit and places such as its rural houses, medieval churches, Santueri Castle, the natural port of Colom, modern golf courses like the Vall d'Or and the most prominent restaurants in the region. Another of the main attractions of Felanitx are its beaches and its white sand bays and translucent waters, always illuminated by a pleasant sun. The tranquility of the Mediterranean Sea makes it possible to practice water sports and sailing. With more than 17000 inhabitants, Felanitx is the fourth largest municipality in Mallorca and its spectacular views and locations sees this number grow with the arrival of tourists looking to enjoy its 15 km of spectacular beaches and coves. In addition, the pleasant Mallorcan character contribute to make the holidays full of fun. Cala Brafi: this beautiful U-shaped naturist cove is made of stones, rock and fine sand. Due to its sheltered location, it is very quiet, ideal for disconnecting from the hustle and bustle. Cala serena: this cove is also known as Caló de Ses Dones. It is made of sand and rock and is located in the urbanized Cala d'Or. Its waters are just as clean and hypnotic as those of its adjoining beaches. It has the peculiarity of being embraced by large rocks, which makes it very attractive for the most adventurous ones to jump to the water. Cala Mitjana: This sandy beach maintains a relaxed climate of great beauty. Its turquoise blue waters surrounded by lush pine trees invite you to enjoy and to dive to explore its seabed. Cala Sa Nau: comprised of fine sand, rocks and stones, the small Cala Sa Nau has the privilege of being surrounded by a wooded landscape of pines that provide a natural shade which acts as a shelter from the sun allowing you to relax after the bath. Its waters are a crucible of crystalline colors. If you are thinking of traveling in a group or with the whole family to Felanitx, the best option is to rent a villa with a private pool or a house or chalet in order to be able to have the comfort and amenities of a private area and have the freedom of an independent house. Felanitx is a beautiful municipality that does not have large buildings. It has several residential areas where we can find a large number of independent chalets and holiday homes. On our website we offer you a great selection of villas in Felanitx to enjoy a memorable holiday with friends or family.